The United Nations' Special Rapporteur on the Right to Food, Olivier De Schutter, has backed citizens worldwide who are demanding a fundamental shift in food and agricultural research to make them more democratic and accountable to society. A related website (www.excludedvoices.org) —also launching on 16 October — brings the concerns of marginalised food producers from West Africa, South Asia, the Middle East and the Andean region of South America to a global audience. "Food and agriculture policy and research tend to ignore the values, needs, knowledge and concerns of the very people who provide the food we all eat — and often serve instead powerful commercial interests such as multinational seed and food retailing companies," says project leader Dr Michel Pimbert of IIED. "Agricultural research and policy must shift to focus on what farming communities and food consumers want and need. Farmers and other citizens must play a central role in defining strategic priorities for agricultural research and food policies." 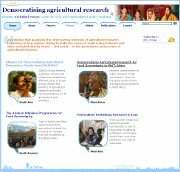 The multimedia publication presents the findings of citizens' juries — held in 2010 — at which farmers, pastoralists, food processors and consumers from Mali, Senegal, Burkina Faso and Benin heard evidence from expert witnesses and made recommendations about the future of agricultural research and its governance. "The democratisation of agricultural research is a vital for those who seek to make the human right to adequate food a reality," writes De Schutter. "I wish to applaud the efforts that led to citizens’ juries in West Africa and farmers' assessments of public research for making such a significant contribution to the key values of participation and ownership that are at the heart of what democratisation means." "Achieving food sovereignty requires radically different knowledge than that on offer today in mainstream research institutes and policy think tanks," says Michel Pimbert. "Such a transformation depends on farmers and 'ordinary' citizens directly deciding what kind of agricultural research they want – for whom, how it should be done, where and by whom, and with what likely consequences." "This is why the democratic process described here is so important for food security, local livelihoods and human well being, and resilience to climate change." "The 2008 food price crisis was a wake up call to the reality that despite advances in agricultural research, about a billion people remain hungry," says Farah Karimi, executive director of Oxfam-Novib. "In an ever more interdependent world, the global challenges of climate change, food and financial crises are putting pressure on food systems. It is therefore ever more important to re-examine the resilience of small-holder agriculture, and its great contribution both to local and global food security." "The book highlights the issues of West African farmers on how they see agricultural research best serve their interest and the global public good of sustainable and equitable food systems," adds Karimi. "As Oxfam Novib, we happily supported this important research of the IIED. Oxfam Novib commends the work of Michel Pimbert and IIED, not only for this critical and well written analysis, but also for creatively bringing forward the voices of West African farmers in this innovative multi-media publication." Dr. Michel Pimbert is the Team Leader of Food and Agriculture at IIED. The multimedia e-book – Democratising Agricultural Research for Food Sovereignty in West Africa - is co-published by the International Institute for Environment and Development, the Coordination Nationale des Organisations Paysannes du Mali (CNOP), the Centre Djoliba, the Institut de Recherche et de Promotion des Alternatives en Développement (IRPAD), Kene Conseils, and the Union des Radios et Télévisions libres du Mali (URTEL). The book and the process it describes were co-funded by the Government of The Netherlands, the Swiss Development Cooperation, Oxfam-Novib and The Christensen Fund. Food sovereignty is the right of peoples to healthy and culturally appropriate food produced through ecologically sound and sustainable methods, and their right to define their own food and agriculture systems. It puts those who produce, distribute and consume food at the heart of food systems and policies rather than the demands of markets and corporations.